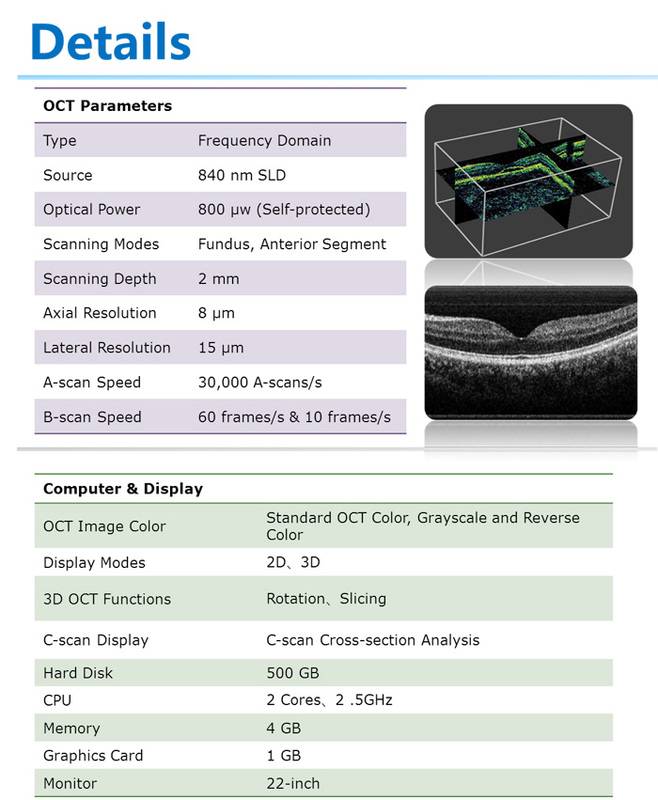 Optical Coherence Tomography (OCT) is a new, noninvasive, and noncontact, imaging technology which can image retinal structures in vivo with a resolution of 5 to 8 microns. Cross-section images of the retina are produced using the optical backscattering of light in a fashion analogous to B-scan ultrasonography and confocal microscopy. Cross-sectional images of the retina are revolutionizing the early detection and treatment, and greatly ensure the quality of patient management. 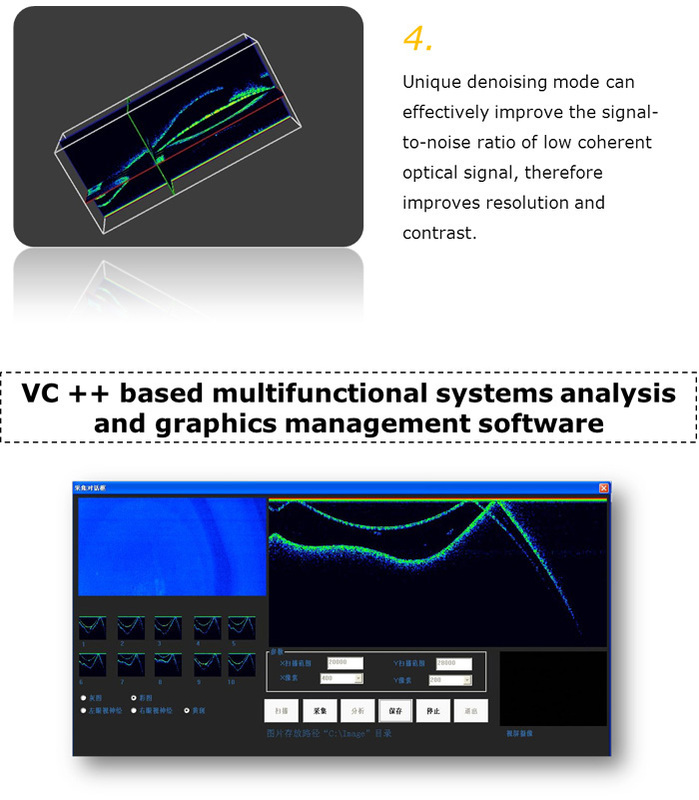 In vivo, cross-sectional images and quantitative analysis of retinal features to optimize the diagnosis and the monitoring of retinal disease and enhance pre- and post-therapy assessment. 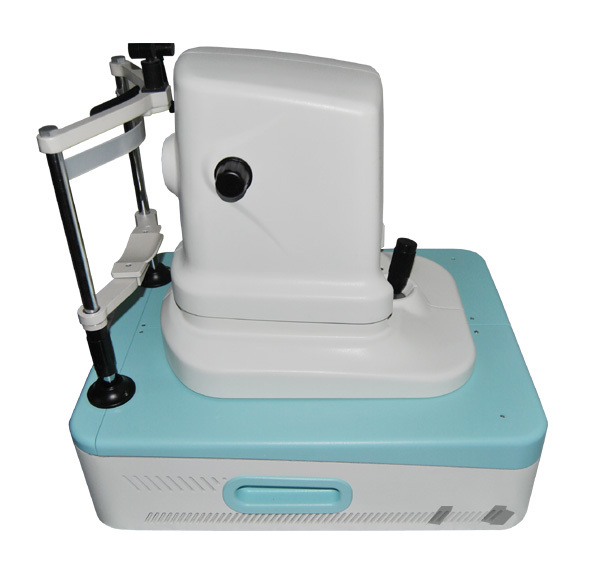 High-quality images and accurate measurement of RNFL and the optic nerve head to assist in the detection and management of glaucoma. Cross-sectional images are valuable for clinical evaluation of macular holes, macular edema and other retinal pathologies. Precise location of pathology to expand diagnostic confidence and therapeutic precision. 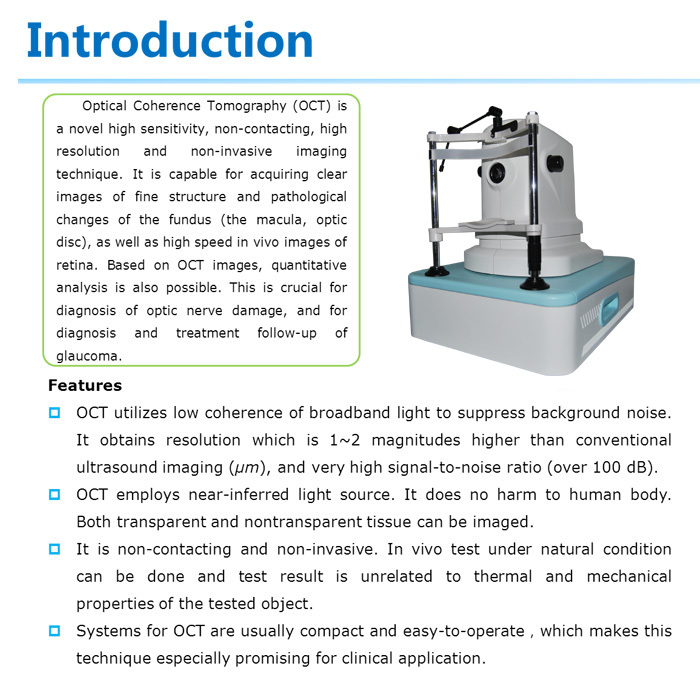 OCT is a kind of non-invasive bio-tissue imaging with ultra-high resolution. Its theory comes from the different reflectivity of the various tissue structures. In the ophthalmological OCT imaging, different colors stand for different reflective intensity. Usually red represents the high value, and black and yellow represent low and middle, respectively. 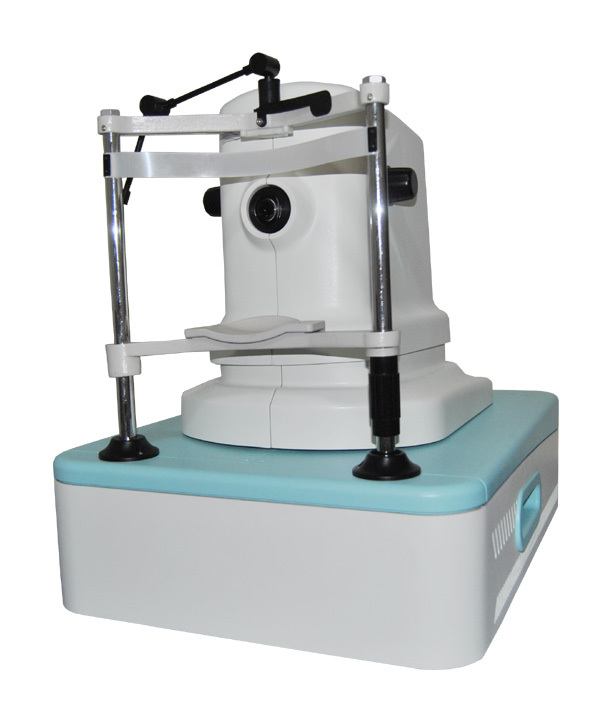 The inner structure image helps doctor to quantitatively analyse the thickness of the center fovea. Moreover, a database is built to make contrast among a variety of people. 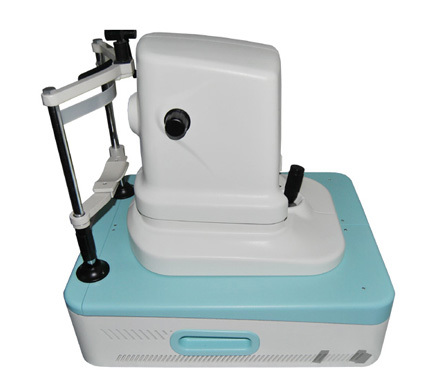 According to OCT images, some potential disease which is contained in the inner structure could be clearly found, that’s the remarkable advantage for OCT imaging technology. Fundus camera image with indicated scanning position(left). (right)Cross section taken along the line in (left)( RPE&CCL-Retinal Pigment Epothelium &Choroidal Capillaries layer ,RNFL-retinal nerve fiber layer, PRL-Photoreceptor layer,I&OPL-inner&outer plexiform layer.Foveal thickness is about 145μm. 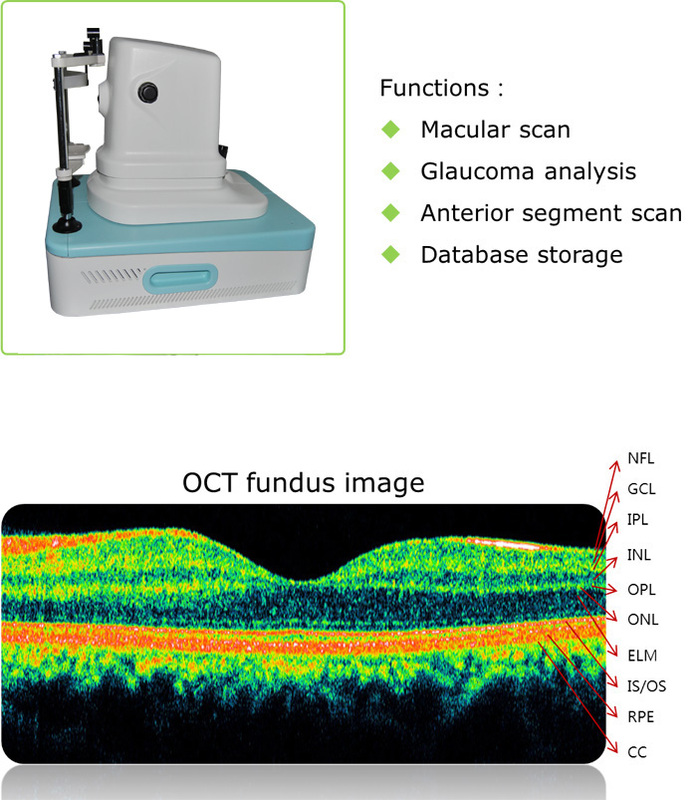 Tracking the record of the optic nerve fiber’s thickness around the optic disc is pretty important for diagnosing and pursuing the diseases of glaucoma and other optic nerve degeneration diseases. 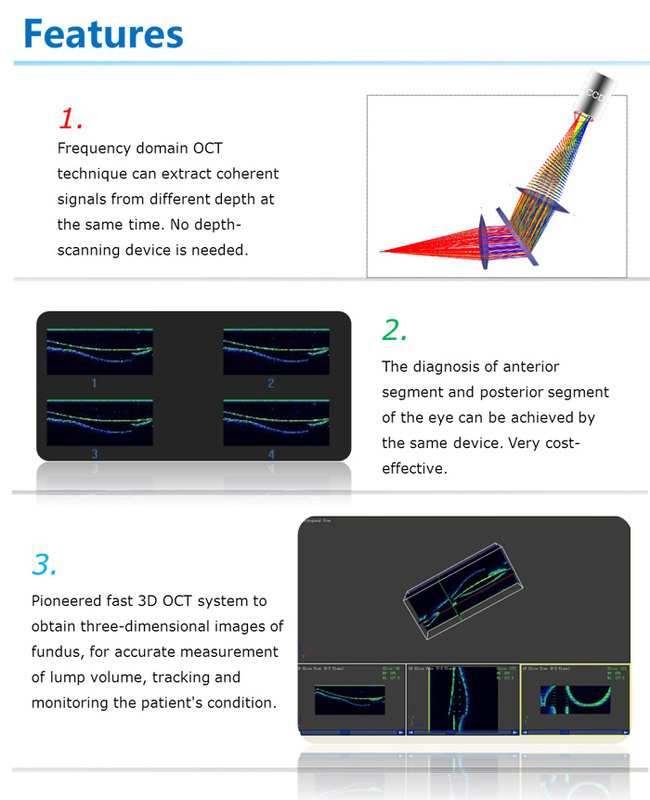 OCT is known as a powerful imaging method for early glaucoma diagnosis, and has many advantages, such as high sensitivity, high resolution and repeatability. OCT is even able to find the early degeneration of nerve fiber thickness. Fundus camera image with indicated scanning position (left) .OCT image of fundus optic nerve plexus (right).